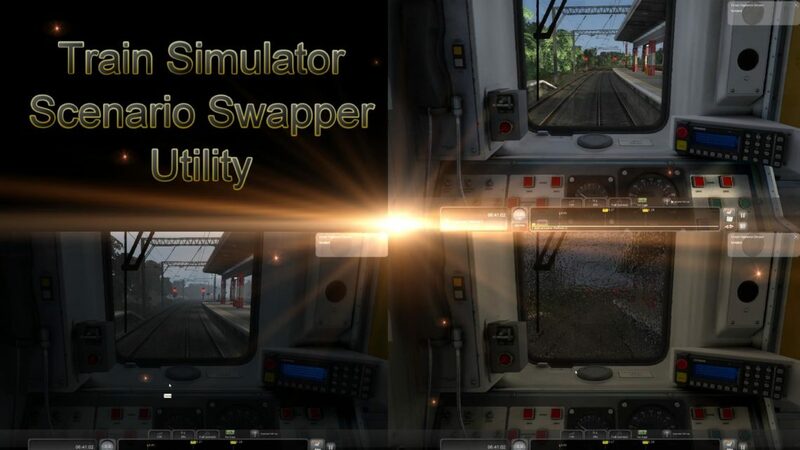 Train Simulator Scenario Swapper Utility is a batch file-driven utility to assist scenario creators with storing multiple versions of scenarios and sharing or running them under the one scenario name in Train Simulator. This means it is possible to create one scenario and then make and store multiple versions of it with different combinations of seasons, weather, pop-up text, timings, scenario and rolling stock, so each version could be activated quickly and easily when so desired by running a batch file and typing in a number. To install the utility, download the TSSS_Utility.zip file and place it in the drive or folder you want to keep it in, then extract all the files (all the compressed files are stored within a TSSS_Utility folder). Its important that a couple of files are updated with the path the utility is installed to, in order for files to correctly copy during processing. Compatibility – developed under Windows 10 and tested with TS2019. It should work with earlier versions of TS. It was also tested in Windows 7. The only issue was with drag and drop, which required a different approach than how it can be done in Windows 10. The second video explains how to drag and drop if its not working for you. Thanks for your time in downloading this and I hope you find it useful. There’s some great scenario creators out there who might find some creative uses for it. Your feedback is always appreciated. Please don’t bother the admin on Alan Thomson Simulation (website or Facebook group) with any support questions, as I am happy to answer them (but I ask patience, as I live on the other side of the world to most of you). I've just started getting into writing batch and powershell scripts which can be used with TS and hope I can build on this to create useful utilities. I've also started learning route building and have created some scenarios, although nothing much worth publishing. I still have a desire to learn, and hope to someday become proficient in 3D modeling so I can produce assets for TS.